Hole In One International’s sister company, Odds On Promotions offers a variety of innovative promotions, including Duck Races, designed to help you increase awareness and raise more money for your cause. Duck Race: A Great Golf Fundraising Promotion! First, you’ll sell as many numbered rubber ducks to your contestants as possible — for a fee, of course! How much you choose to charge each individual for a duck and/or allotted number of ducks is strictly up to you. Participants can either purchase their ducks in person at a designated location or, if your company/organization has a website, you can even sell them online! Feel free to cut participants an “early bird” deal, where if they purchase before a predetermined registration deadline, they can receive their duck(s) for a cheaper price! 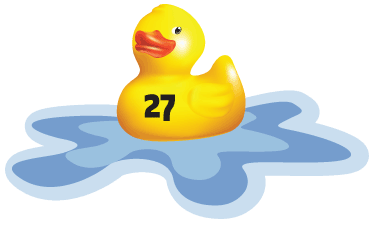 On the day of the duck race, all of the numbered ducks will be dropped into a river and race downstream. If one of the ducks reaches the finish line first and number of the contestant’s winning duck happens to match Odds On Promotions‘ preselected number, then that contestant will be a grand prize winner… of any prize value up to $1,000,000 (you make the call as to how much you want to insure the duck race for)! Want those fundraising dollars to be increased even more? Feel free to split the value of the insured prize 50/50 between the contestant and your non-profit/charitable organization! And don’t forget to award your first, second and third place winners with smaller, self-insured auxiliary prizes, regardless of whether or not they end up being an insured grand prize winner. Don’t let them leave your event empty-handed! As you can see, a duck race fundraiser is perfect to hold and insure before or after your golf tournament… or even as a stand-alone event! Feel free to give Odds On Promotions a call at 888-827-2249 for a free, no-obligation quote. You can also email them with any questions. Before you do, though… be sure to check out the great duck race fundraiser video below to get an idea as to how the promotion works.